In as many projects as we can we like to be involved in the early stages of design and development. By doing this we can work along side designers and offer advice on the product design to optimise the performance and cost of the casting. 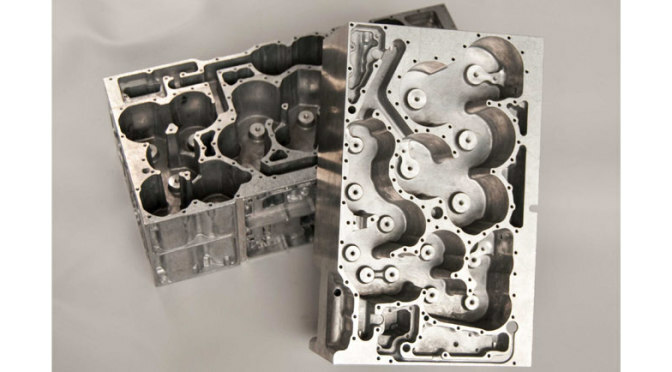 Early involvement in a project enables a smooth transition from initial concept and prototyping through to volume manufacture as either a gravity or high pressure casting. We work in partnership with a sand foundry to offer sand castings in a range of alloys which are machined in-house. Sand casting is ideal when there is lower volume which does not justify the investment in gravity or high pressure tooling. The start up costs are lower as the moulds are made from wooden or resign patterns and there can be a quick turn around achieved. There are a range of options we can offer for prototyping. Firstly there is the sand casting option described above which is best for repeat prototypes/low volume production. However when you are looking to replicate a high pressure casting it is very hard to do as thin wall sections can not be achieved by sand casting. We can now offer a service where moulds are 3d printed and metal is injected into the mould under vacuum. This means we can replicate the design characteristics of a high pressure casting and importantly the prototypes is made in the same alloy as it would be under volume production. Prototypes like these can be usually turned around in two weeks. We can also machine prototypes from solid in our extensive CNC machine shop. On a number of occasions we have manufactured machined from sold prototypes while gravity and high pressure tooling is being manufactured. This enabled our customer to build and test their products and implement any changes required while the tool was still being manufactured.